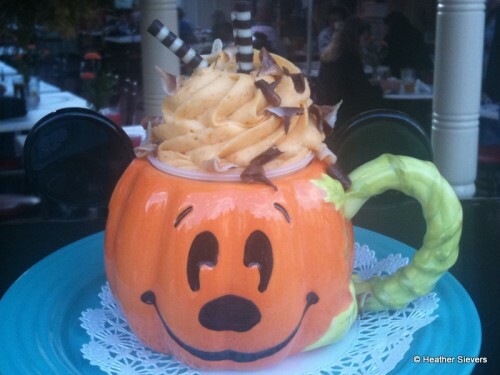 Dining in Disneyland columnist Heather Sievers has a new crawl for those of you headed to Disneyland soon — all about the pumpkin!! Before I even start, I must apologize for the quality of these photos. I was having a very bad camera day; both my camera battery AND my spare were dead (oops) so I ended up using my phone to take photos. I knew I would not have another chance to work on this “Pumpkin Treats Crawl” before Halloween gets into full swing and I wanted to be sure you could hit the park for all of the pumpkin-y goodness! 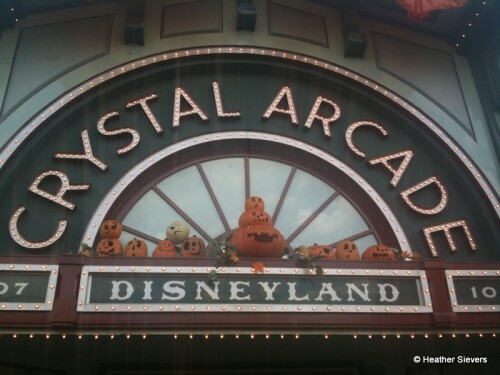 Halloween time at Disneyland is most definitely my favorite time of the year. I love the spooky-but-sweet decor that seems to appear overnight. The Haunted Mansion’s transformation into Jack Skellington’s ominous world is always exciting, and Space Mountain Ghost Galaxy adds its resident monster, Bob, to the ride as an added bonus. My absolute most favorite thing though? Pumpkin flavored treats. I’ve always been a pumpkin lover, and if there is something “pumpkin flavored” on any type of menu, I’m always game to give it a whirl. Every year at Disneyland I try and eat my way through their holiday specialties. This year, I’ve decided to compile them and create a “Pumpkin Treats Crawl” for you. Why should I be having all the fun, right? 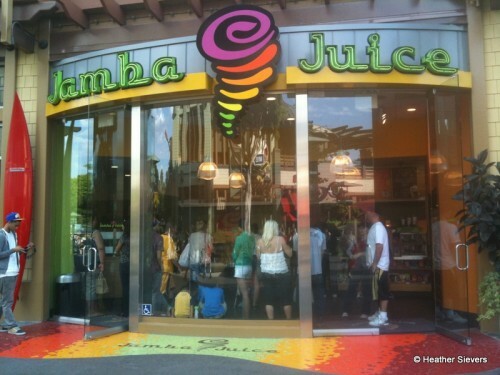 Our crawl is going to start in Downtown Disney at Jamba Juice. This is actually one of my most favorite stops along our little trip. It gets you right in the mood for pumpkin yumminess. Here, you’re going to pick up a Pumpkin Smash Smoothie. Consider this a “warm up” for the next leg of the trip, which takes place on Main Street USA. The Pumpkin Smash is seasonal — they usually run from late September through November. 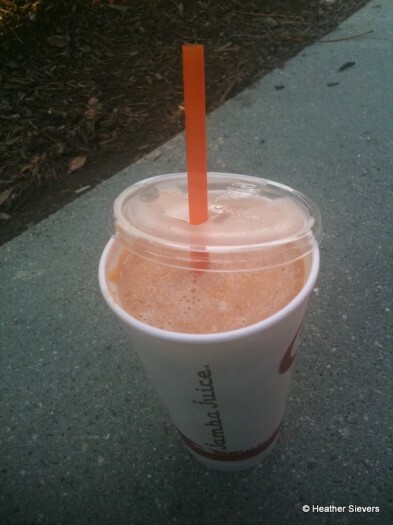 I am told though, that some Jamba Juice stores have them on their “secret” menu year round. I need to find a local one that does! Depending on how many people you’re “crawling” with, I recommend getting a large size smoothie to split into smaller cups. It’s much more cost effective to do it this way. You can get a 16 oz (small size) smoothie for $5.15, OR you can double your order with the 32 oz. Power Size (largest) for just $1.60 more. AND they have no problem splitting it into two 16 oz. cups for you. To me this is a no-brainer anytime you order for two or more people. That is, if you can agree upon the same flavor. 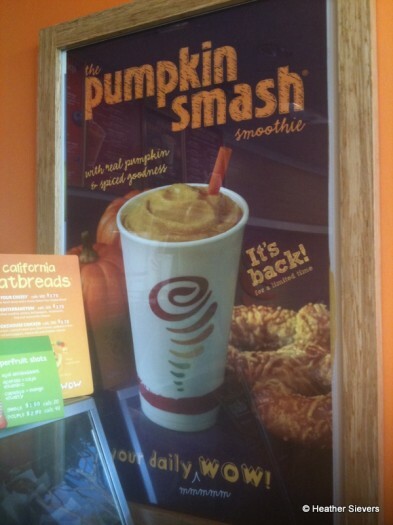 I recommend the Pumpkin Smash Smoothie plain with no add-ins. This way you get the full flavor of the sweet pumpkin and its savory spices. It’s just like drinking a cool slice of pumpkin pie. After your trip to Jamba Juice, head over to Disneyland’s Main Gate (you are allowed to bring your Jamba Juice in if you’d like) and continue into the park. The first thing you will notice is the lovely fall decor. Everything — and I mean everything — is decorated to the nines. Every window, every storefront, every everything. 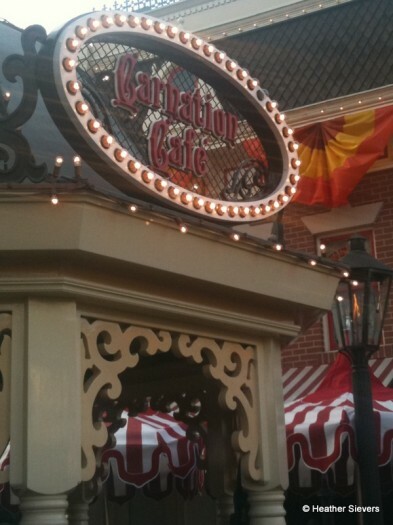 Take some time to notice all of the fun details as you make your way to your second stop, the Carnation Cafe. At the Carnation Cafe, you can choose whether or not you’d like to sit down or take your treat to go. Here, they are offering a Hazelnut Tiramisu topped with Pumpkin Spice Mousse served up in an adorable Pumpkin Mickey ceramic mug. Unfortunately, I did not stop for this one, as I am not a tiramisu fan. That doesn’t mean you shouldn’t stop, though. If you like tiramisu, it’s a must. 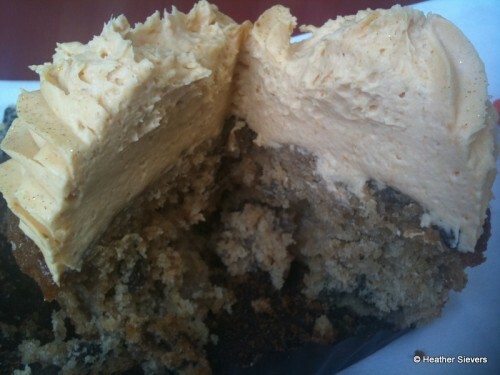 I can speak on behalf of that pumpkin mousse though; it’s divine and will be seen again along our route. The Hazelnut Tiramisu will set you back $7.99, but you do get to keep the adorable mug. 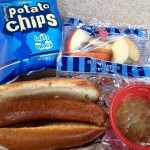 AND if you’d like to mix your route up a bit, this item can also be found at in New Orleans Square at Cafe Orleans. Once you’ve finished your tiramisu, pop into your third stop, the Blue Ribbon Bakery — right next door to the Carnation Cafe. *Side note, I recommend purchasing items from stops three & four, then taking your treats to a nice table over at Coke Corner to enjoy. At the Blue Ribbon Bakery you’ve got a few options to choose from, OR get them all! Here you’ll find my top favorite pumpkin snack item. The Pumpkin Muffin. For just $2.99, you can sink your teeth into a moist, delicious muffin that really tastes more like cake. The muffin is quite big — plenty big enough to share. 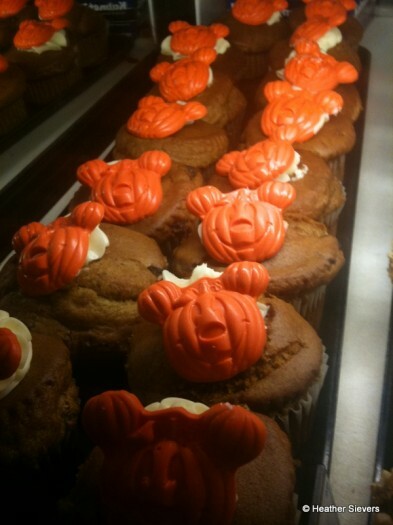 It’s topped with a dollop of cream cheese frosting and an orange-colored chocolate Mickey pumpkin. If you feel inclined to do so, you can also pick up a warm pumpkin beverage here at the Blue Ribbon Bakery. 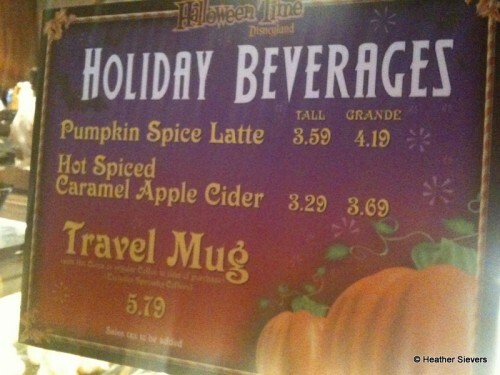 They’ve got a Pumpkin Spice Latte available in two different sizes. 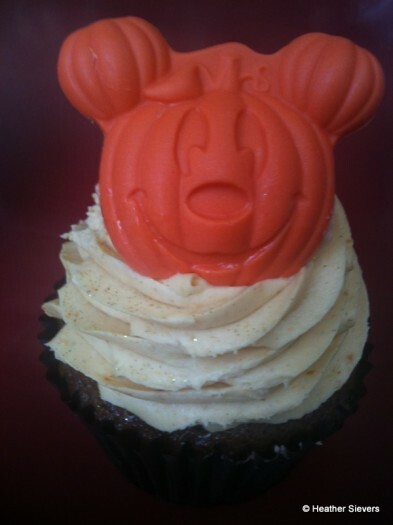 The Blue Ribbon Bakery also carries the seasonal Nutty Caramel Apple Cupcake, which is topped with Pumpkin Spiced Mousse. 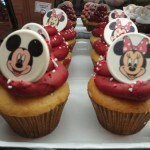 I purchased mine here, but for the full experience I recommend you get yours over at the Plaza Inn; we’ll be there soon! The Nutty Caramel Apple Cupcake will set you back $4.99. Personally, my favorite part of this treat was the Pumpkin Spiced Mousse (which is what we’re here for, right?). But here’s the deal. 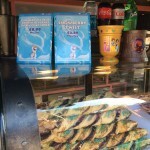 At the Blue Ribbon Bakery there are two options for this treat. You can get the plain cupcake like I did, or you can buy it in a souvenir Donald Duck Halloween ceramic mug for $6.99 — only $2.00 more. IF you decide to go for the mug, wait and buy it at the Plaza Inn. Personally, this item was not my favorite, I’m really not sure why it is marketed as a cupcake, because it is much more like a muffin than a cupcake. I did not taste the caramel or the apple. In fact, to me this tasted like a carrot cake muffin. There were nuts, raisins, and bits of apple in the mix, but really not a whole lot of flavor, that is until you take a bite of it with the Pumpkin Spiced Mousse. I’m going to be honest here, I grabbed a fork and “spooned” off the Pumpkin Spiced Mousse. It’s so creamy, and not at all too rich. I also LOVE the way the orange edible glitter looks sprinkled on top. It’s SO pretty. 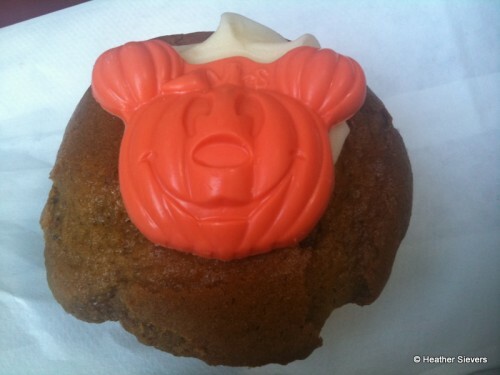 When purchased without the souvenir Donald mug, the “cupcake” comes topped with the same orange colored chocolate Mickey Pumpkin that the Pumpkin Muffin has. 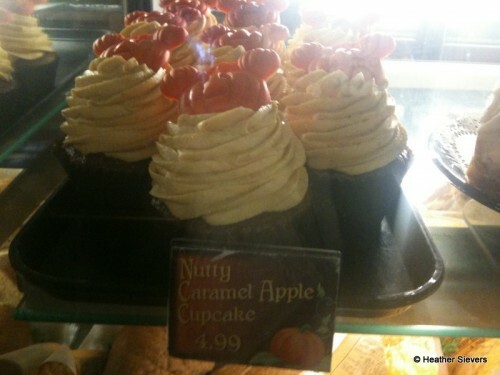 Here’s how the “Donald” Nutty Caramel Apple Cupcake looks at the Blue Ribbon Bakery. 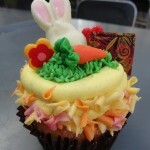 Notice they actually call it a cupcake…. Again, sorry for the awful photo. Your Fourth Stop along the pumpkin highway continues just two doors down at the Candy Palace. 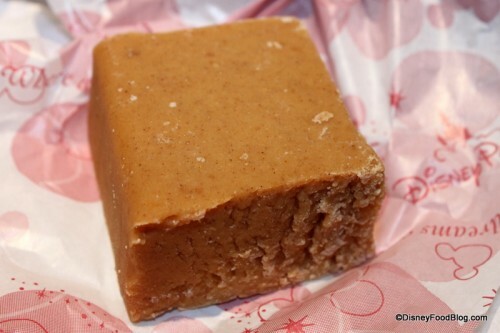 Unfortunately, I did my crawl a bit too early and Pumpkin Fudge was not yet available. It SHOULD however be there very soon (if not there already) and if I see it myself, I will update this section with photos and prices. 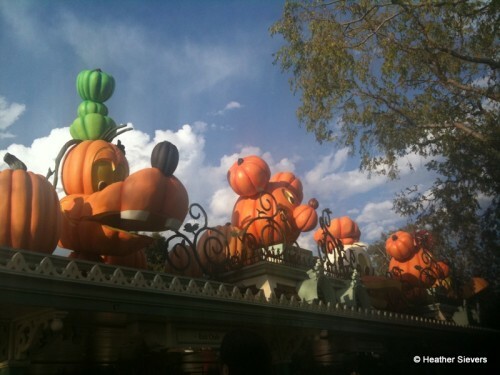 Your fifth and final stop on our Main Street Pumpkin Crawl is the Plaza Inn. 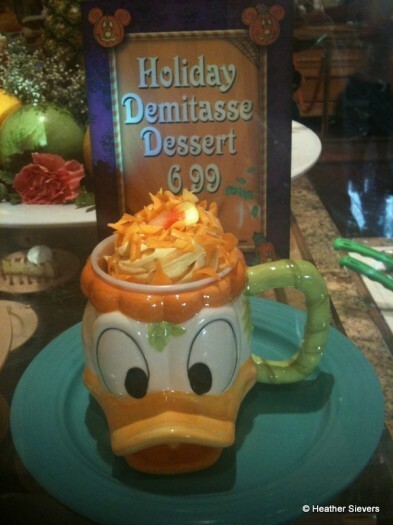 Here you’ll pick up the adorable Holiday Demitasse Dessert (IF YOU DIDN’T GET IT AT THE BLUE RIBBON BAKERY). Thank you very much for agreeing with me, fantastic cast member, because your buddies over at the Blue Ribbon Bakery are calling this a cupcake! 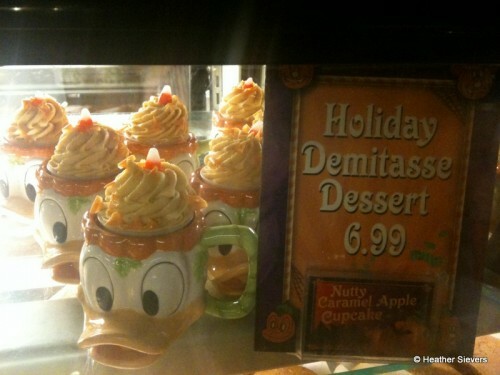 Anyhow, for $6.99 you can eat your final pumpkin treat and then take home this adorable Donald ceramic mug. Even the back side is cute! Oh, and in case you’re wondering what the word “demitasse” means, it’s basically a fancy word for “cup.” I looked it up. Looking for an extra credit pumpkin crawl treat? If you’re REALLY lucky and can weasel your way into a Club 33 reservation, you can pick yourself up some Fancy Pumpkin Beignets. No connections to Club 33? Feel free to do some homework and make them yourself! The recipe can be found here. 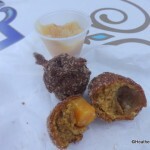 Plan on taking the Main Street Pumpkin Treats Crawl? Let us know how it goes! By the way, scoot to Blue Ribbon Bakery quickly. It will be shutting its doors for good very soon, though we have no official end date at the moment. Oh my, yumm!! Can we have a crawl for WDW? yes!! Pumpkin is my FAVORITE and I always wonder why it’s only served for Thanksgiving.. this is a perfect post for me! The smoothie looks awesome and I personally love tiramisu so I would definitely pick that up in the cute mug… though the Donald mug is awesome as well! 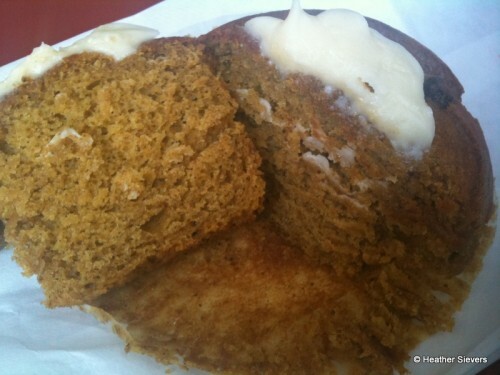 One obseravation though.. that pumpkin muffin just does not have enough cream cheese frosting! Am I right??!? 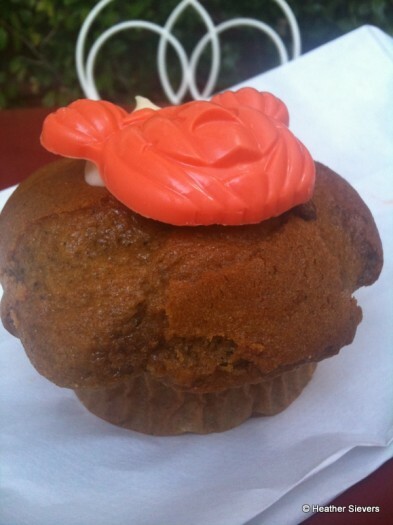 I’d love to see a post about pumpkin treats at Disney World as well! Thanks Heather and AJ! Bonnie — We’ll put it on the to-do list! 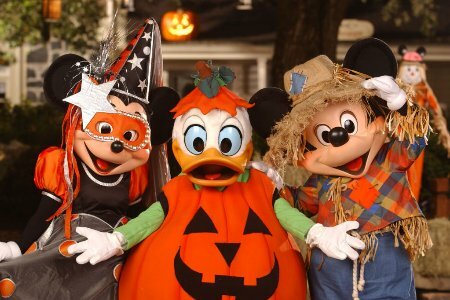 I would also like to see a pumpkin roundup for WDW! I’ll be down there in a month and I basically have pumpkin in everything I eat from September to November! I just got back from WDW yesterday and those cute Donald mugs are in WDW. I didn’t notice anything pumpkin flavored there though. I didn’t see the\ mugs when we checked in on Monday the 19th but on Saturday the 24th they were at the marketplace in the Beach Club with chocolate cupcakes in them and they were $6.45 each. I bought 4 of them just for the cute mug since Donald is my favorite. (AJ if you would like a picture of the mug i can take one for you). I had asked other cast members if they had any other characters and if they were sold anywhere else and most cast members said that had just seem then within the past 2 days there and weren’t sure if there were any characters. That same day we saw them advertised at Beaches and Cream with ice cream in them and then again in the Magic Kingdom at Aloha Isle with dole whip soft serve in them. So these cute Donald mugs seem to slowly be making their way into WDW and maybe some pumpkin items will follow! Looking at the cross section, the Pumpkin Muffin looks moist and fresh. Hmmm! Great crawl! 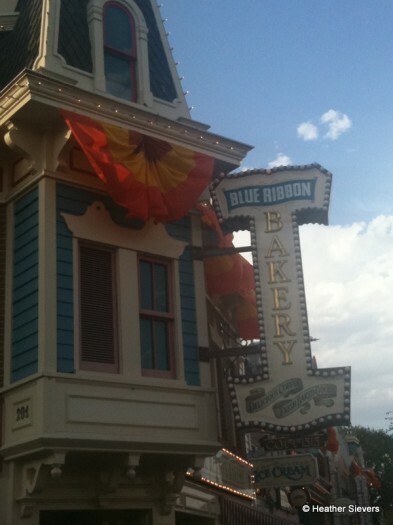 But the Carnation Cafe was closed during my visit last week, and I’m pretty sure the Blue Ribbon Bakery was too. They’re putting in that Jolly Holiday Bakery in its place. @Jen – I was at all of these places just this past Friday and everything was open. I just called Disney dining to ask about closures and was told that both Carnation Cafe and Blue Ribbon Bakery would remain open through October, closing sometime in the beginning of November. The expanded Carnation Cafe and the new bakery, Jolly Holiday Bakery are due to open at the first of the year. Jolly Holiday Bakery is going in down the way from Carnation Cafe and Blue Ribbon Bakery. It’s going to be in the old Annual Passport photo place, across the way from Plaza Inn and next to Coke Corner. I am going to DLR tomorrow for 4 days and have a “reservation” at Carnation Cafe, so it had better be open 🙂 I was there a week and half ago and both were open. If you go during the week, now that the crowds have died down, Carnation Cafe will close about 4 pm, since Disneyland closes at 8 pm. Maybe that is why it was closed? 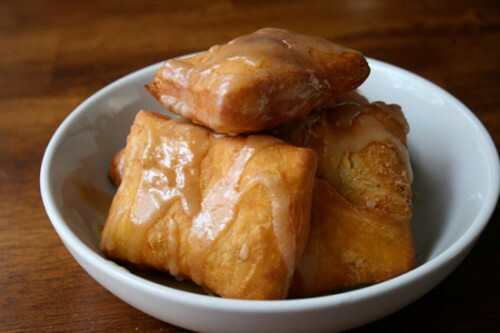 The pumpkin beignets can also be found at Cafe Orleans! 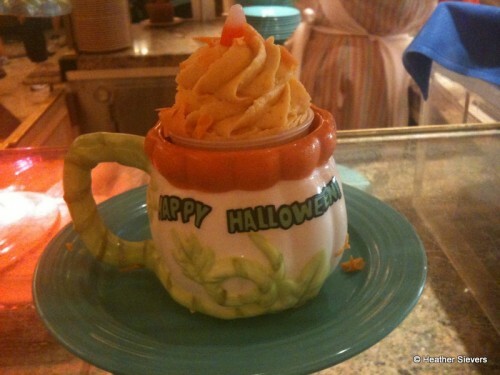 @Maus – I stopped by Cafe Orleans this past Friday and at the time their only pumpkin dessert was the tiramisu topped with pumpkin mousse, served in a ceramic pumpkin Mickey mug. Have you had them there this year? Unfortunately no, I always arrive after they are closed. But the Mint Julep bar told me they have them there and they did last year. I’ll try to check again on Tuesday.